lazy afternoons in gently swaying hammocks. It's also time for books. those warm summer days...and nights. We kick things off Sunday, July 2 with Beach Bag Reviews. Stop by to read what we have to say about some of the books that have been filling our summer days with romance joy. Monday morning, July 3 brings Maria's blog tour review of WIRED by Julie Garwood. This contemporary romantic suspense novel in Garwood's Buchanan/FBI series will be released July 4. 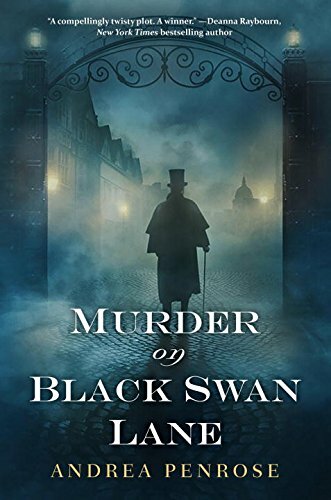 Stop by Monday afternoon for Janga's review of MURDER ON BLACK SWAN LANE, a new Regency mystery by Andrea Penrose. This book launches a new series by Penrose, who also writes as Cara Elliott and Andrea Pickens. On Tuesday, July 4 Americans will commemorate our Independence Day with cookouts, parades, and fireworks. I wish all who celebrate a very joyous and safe holiday! One of my favorite new authors will also be celebrating the release of her newest historical romance on July 4. Stop by to read what I have to say about THE WICKED HEIR, by Elizabeth Michels. 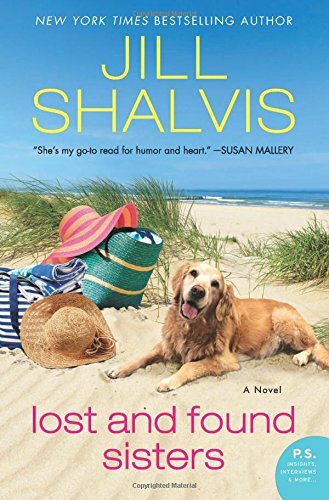 The Jill Shalvis Lost and Found Sisters tour stops here on Wednesday, July 5 with a review by Janga. The novel, which released June 20, marks Shalvis' women's fiction debut. Beginning Friday, July 7, the Dish will be on vacation for two weeks while we recharge our internal batteries...and catch up on our reading. See you on the 21st! On Friday, July 21 I'll be spotlighting the books in the Historical Romance:Long category that are finalists for the prestigious Romance Writers of America® RITA® Award. Winners will be announced the evening of July 27th at the RWA national conference in Orlando, Florida. 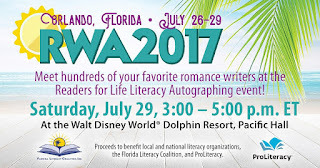 The week of July 24 is the Romance Writers of America® national conference in Orlando, Florida. I'll be there, attending workshops, connecting with authors, bloggers, and readers, taking lots of photos and, of course, gathering books and swag to share with readers here at the blog. 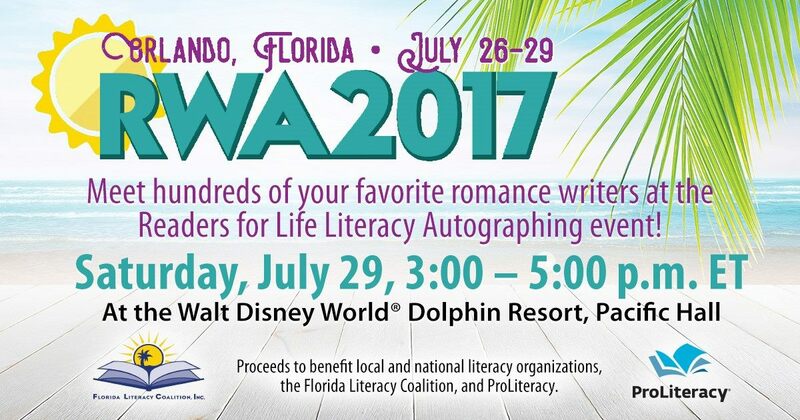 This year's 2017 Readers for Life Literacy Autographing will be Saturday, July 29, from 3:00 - 5:00 p.m. at the Walt Disney World® Dolphin Resort, Pacific Hall. The Autographing is open to the public, admission is free, and proceeds from the books sold by the more than 400 romance authors signing will benefit the Florida Literacy Coalition and ProLiteracy. Click for a list of the authors who will be signing. 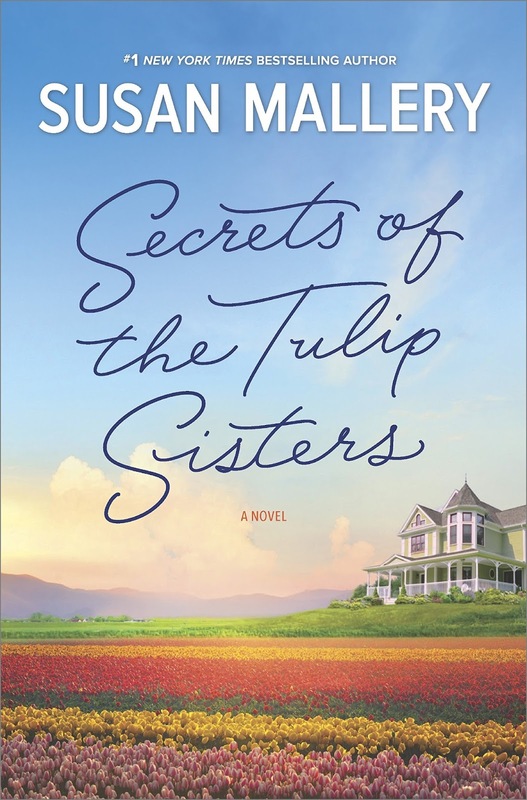 We round out the month on Monday, July 31 with the TLC review tour of Secrets of the Tulip Sisters by Susan Mallery. Janga will be sharing her thoughts about this new women's fiction novel by Mallery that was published July 11. What's on your calendar this month? Any vacations? Special events? Books you're looking forward to reading? Will any of you be attending the RWA conference or coming to Orlando for the Literacy Signing? Which of the authors attending this year's signing would you most like to meet? What are the books of which you would most treasure a signed copy? I wish I could attend the RWA conference. Unfortunately, it is not to be. I think there are probably few authors I would not like to meet and so many books I would love to have signed. I am easy, everyone is my fav. And I know that June is half over, but I am figuring this coming attractions post was posted early. staying cool is on the calendar - I'm going to investigate a portable air conditioner - looks like it might be a hot & humid summer. I don't go on vacation til September - to the beach with family - I'll be putting books aside for that. Unfortunately I won't be attending the RWA conference in FL but some of my favorites are Ashe, Bouchet, J. Bourne, Burrowes, Dare, Guhrke, Heath, Linden and JALong. Quite an impressive line-up that will be present there! 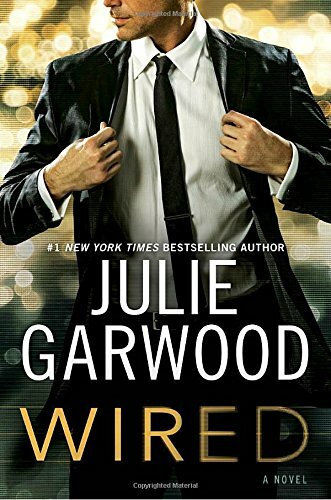 I'm really looking forward to Wired by Julie Garwood, I love, love her books! I also want to get my hands on Lost and Found Sisters by Jill Shalvis, it looks to be a great read. Thanks for the chance to win!! I can't be?I've the Wonderful list of Authors who will be there. Talk about fan girl moments, I'm so sorry I can't make it this year. I will definitely make sure to go to the next one. I am !oiling forward to Devil's Cut by JR Ward,Last Christmas In Paris by Hazel Gaynor and The Writing Desk by Rachel Hauck. No big vacation this summer except for the day trips to the shore and family BBQ's. No vacation scheduled til September, so the rest of the summer will be spent tying to stay cool while also getting some projects done - will need some books for those extra hot days. I'm having a baby shower for my oldest daughter. I'll be a grandmother for the first time and we know it's a boy. I have yet to make a conference (sigh). I don't think I could pinpoint just one author - I have a long list lol. And I have no idea what I would ask them. I probably would just say how much I love their books. I keep all signed books!!! But I am partial to historical authors. Congratulations on the pending baby! What joyous news! no big plans for July - beach vacation isn't til September. If it's very hot in July I'll be trying to stay cool without air conditioning & reading a lot. I can't believe June ended, when did it happen?! The RWA sounds so fun, it's one of the reason that I wish I lived in the US. Have fun there and I can't wait to read about your exploits. Hope you have a great July, Alina! No I won't be attending. Healing from being in ICU and the hospital. As for reading, Fuel for Fire by Julie Ann Walker, Survive by the Team by Cindy Skaggs and the Seven Brides for Seven Brothers series written by Roxeanne St. Clair, Lynn Rays Harris, Christie Ridgway, Joann Ross, Melody Anne, Ruth Cardello and Barbara Freethy. Enjoy your time off! Happy reading. Sorry you've been in the hospital, Pamela. I hope your recovery will be smooth and complete. I enjoyed the 7 brothers series. Hope you do too! Looking forward to Hope Ramsay's Here Comes The Bride, Marie Force's next book in her Fatal series, and Linda Fairstein's newest thriller! Sounds like some good reading ahead! I have a big milestone birthday coming up this month. I really can't go on holiday anywhere as I just got back a couple of weeks ago from my trip to England and Scotland. I wish that I could but my husband has started a new job, so can't get any time off of work. There are so many attending that I would love to meet. Maybe one of these days I will get to one of these wonderful events. I would treasure signed copies by the Authors of any Historical Romance book. 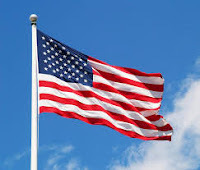 Thank you and a very Happy July 4th to everybody. I just realized that I found this blog one year ago when you had just returned from RWA. I wish I were able to attend, but will be unable. You have introduced me to many new authors. You have added a great deal to my TBR pile. You have fed my book addiction. Shame on You! I would love to meet authors who write historicals and Regencies. I also love many authors of contemporaries. In short, if I were blessed enough to meet any of the authors who will be there, I would be thrilled. As for which books I look forward to reading, I think they are too numerous to mention. I hope you have a wonderful time and bring back pictures for all of us to enjoy. Not to worry, I always take lots of photos. Sounds like another great month! Special events this month will include visiting with lots of relatives for a cousin's wedding out of state. Hope it's a wonderful family wedding! The Late Show--Michael Connelly, Wired--Julie Garwood, Scandalous Ever After--Theresa Romain, Too Scot to Handle--Grace Burrowes, Two Nights--Kathy Reichs, Deadfall--Linda Fairstein, Wildfire--Ilona Andrews, Lost and Found Sisters--Jill Shalvis Secrets of the Tulip Sisters--Susan Mallery, and Perish from the Earth--Jonathan Putnam. As for author-signed books, I'd love to have Julia Quinn signed Bridgertons! Thanks for a good post. I'm traveling from MN to Long Island, NY to spend time with my brother and his family in two weeks. During that visit I plan to meet up with author Jeannie Moon for lunch. I love her books and am excited to meet her. I'll also get to catch up with up with my other niece & her boyfriend who will be driving down from Binghamton to visit. My son will be visiting his girlfriend in Hoboken, NJ at the same time and will drive over to visit too. I'm not attending RWA but look forward to seeing who wins the Ritas!! Enjoy your time off and your time at RWA. Sounds like a fun trip, Eileen. Safe travels! July is really a slow month for us. We do the July 4th celebration and then, nothing. Sorta our reboot month. I do get lots of reading time though, so that's a blessing. I have such a big TBR pile. I will probably close my eyes and point, and that's what I'll read next. Enjoy your time off. I've been doing a bit of that pointing myself lately. Lots of books patiently waiting! I don't have any special/vacation plans for this month. Hope to someday attend the RWA signing but will not be there this year. Would love to meet Tessa Dare, Joanna Bourne, Liliana Hart, Lorraine Heath, RaeAnne Thayne and would love to have signed books from any of them. No vacation plans this month but a couple of day trips down to the shore. Have quite a few birthdays this month as well. One day I hope to get to one of the events. I'd !I've autographed. books by the historical romance Authors. Cathy Maxwell. Grace Burroughs, Diana Gabaldon etc etc. I'm looking forward to reading Shameless, The Tulip Sisters, Fuel For The Fire and Too Scot To Handle. Loved the Highlanders . :) Happy 4th everyone who celebrates.